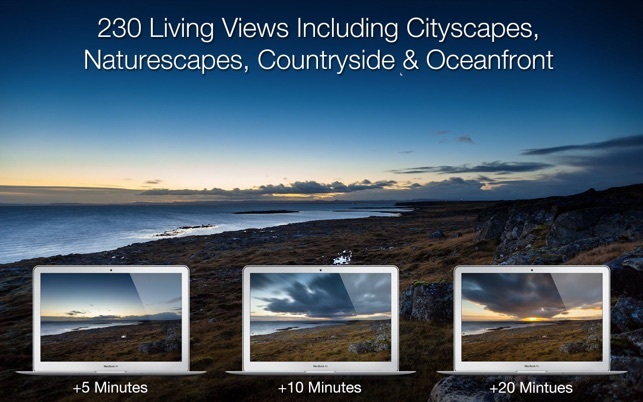 Magic Window brings your desktop to life with beautiful slow moving timelapse views for your wallpaper and screen saver. 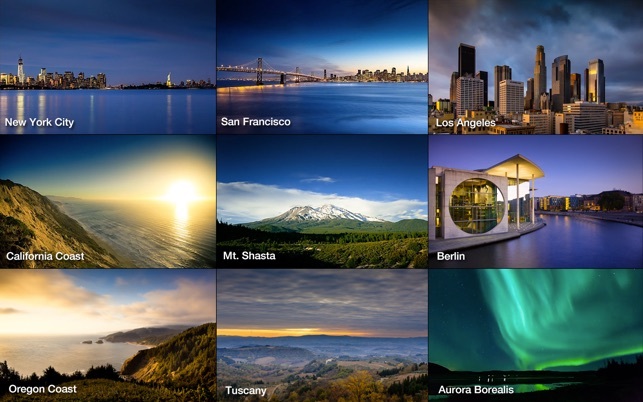 It includes complete timelapse views of coasts, beaches, cities, mountains, lakes, and more. Watch as time and light slowly paint the skies beautiful colors and the cities transform from day to night and back again. 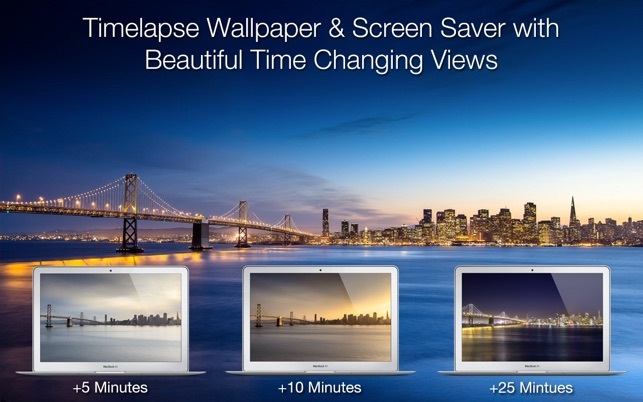 Created by the same team that brought you Magic Window for iPad and iPhone, Timelapse Desktop is a new style of desktop wallpaper made using timelapse photography. The wallpapers slowly blend over time revealing magical changes in scenery and color. 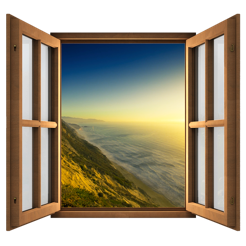 Magic Window includes 230 scenes: 6 are built into the app, and 224 are downloaded after you install the app. We use scene downloads so we can bring you more and more scenes without making the app larger and larger. There are no additional charges for scenes. You can install the app on as many Macs as you want and download scenes as many times as you want. 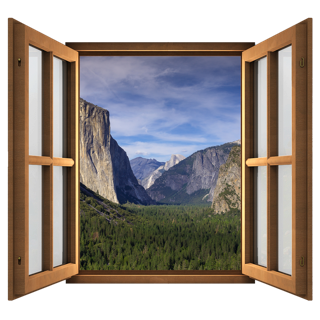 Magic Window scenes are full 16:10 HD resolution (1920x1200) and look fantastic on every single Mac as well as HD displays. 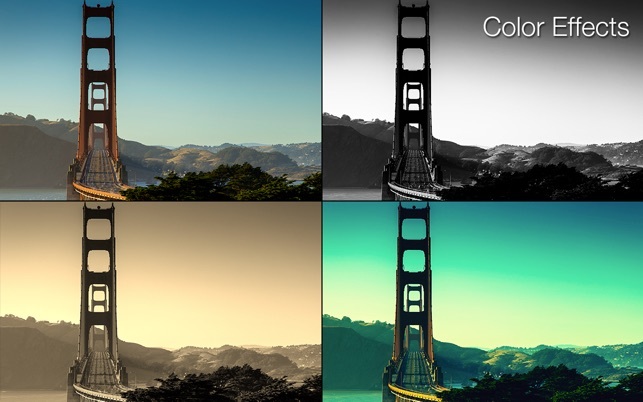 These are truly high definition wallpapers, not stretched low resolution videos. 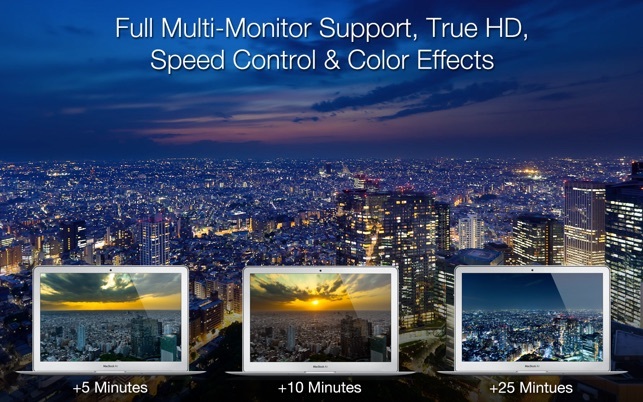 Magic Window fully supports multiple monitors, allowing you to have different scenes on each display and to selectively enable or disable displays. AirPlay can also be used to display the scenes on an Apple TV. 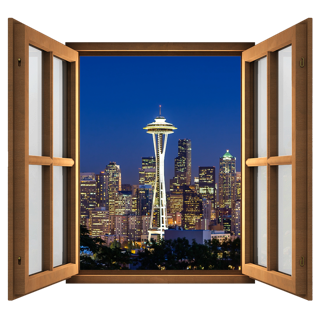 Magic Window offers a variety of speeds that let you control how much CPU it consumes. On the slowest speed Magic Window can consume less than 5% CPU, leaving your Mac free to focus on other tasks. If you already own Tahoe Blue or Magic Window Yosemite National Park and are looking to buy this as an upgrade please be aware this is a separate app that runs independently. After you purchase this you will need to quit the other app and then open Magic Window from the Applications folder. You can still run the other apps however they should be run one at a time. EACH SCENE IS MADE FROM OVER 1,000 PHOTOGRAPHS. 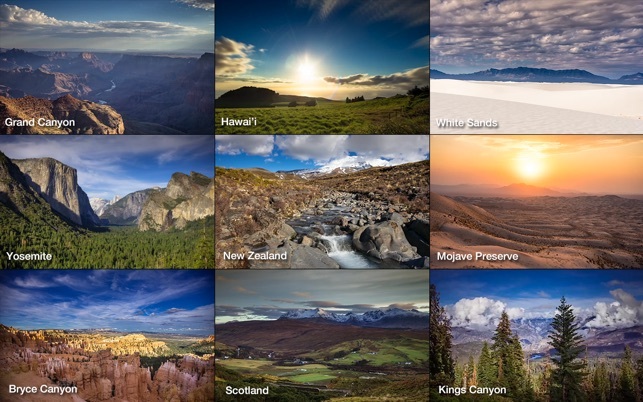 OVER 2,000,000 PHOTOGRAPHS WERE USED TO MAKE THIS APP. This is not a system screen saver - it works independently of the system screen saver. Very nice, but could improve some things. 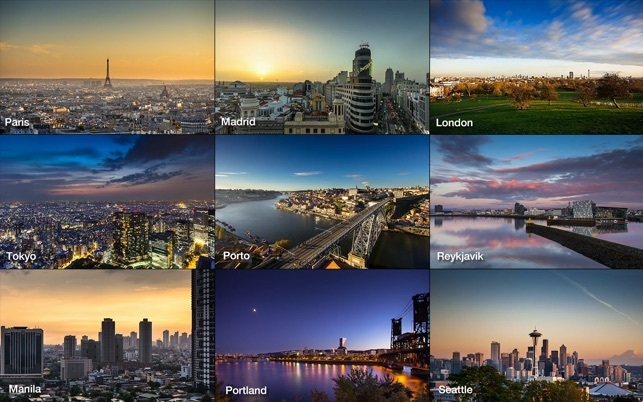 I love the wallpapers, they are very soothing (although it be nice if they added some South America, Bolivia guys, think about it). PERFORMANCE… I noticed the app makes a lot of disk reading, it be nice if they added the setting to load the wallpaper files into RAM, so that there is no unecessary disk reading as it could wear down some HDDs over time. I have 16 gigs of ram, and really it wouldn't be a concern to have the 100MB file on my ram. OPTIONS… Additionally it be nice if they gave us the ability to loop from start to finish then from finish to start, specially for the wallpapers that lack sun or moon, would be awesome to cycle some of the wallpapers as if they went through the complete day night day transition. Bonus points if they also made the wall paper match with the available light for the current user position on earth. Super recommended if you need some dynamic and chill in you background, gives me a sense of the pass of time and I love it. I love this app. 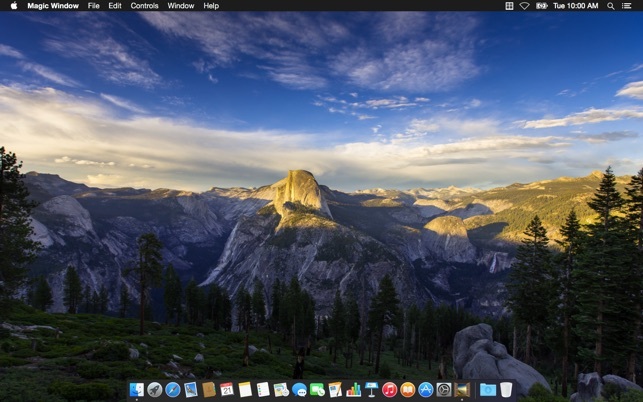 How about putting time and weather on Mac OS. I frequently sit in front of my computer all day. My computer time requires great concentration. 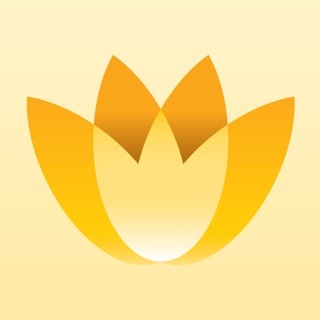 I use your app to remember all the beautiful places in the world. 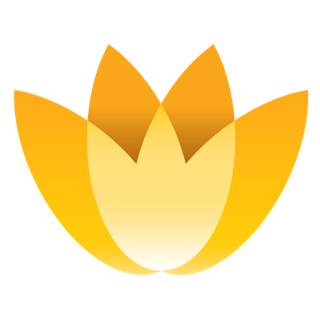 Your app is a brief yet potent refresher for my mind. Because of your hard work and great pictures, I can come back to my task refreshed. I would love to see the time and the weather on the Mac OS app, similar to the apps on the iPad and iphone. I really like this application. The scenes to choose from are outstanding and there are a lot of them to choose from! Well worth the purchase for me. There’s also a 4k version! So you may want to grab that one if it’s applicable to your system.